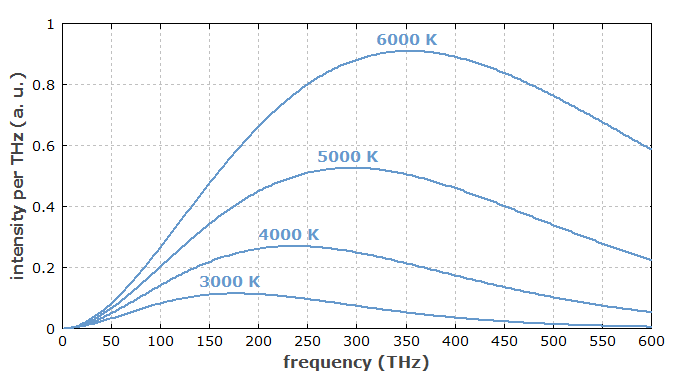 Ask RP Photonics for advice concerning noise specifications, or on the measurement of power spectral densities with electronic spectrum analyzers or with Fourier techniques. You may also order specialized in-house staff training. In the following, both types of quantities are discussed. When the spectral distribution of optical power e.g. of some laser source is measured e.g. with an optical spectrum analyzer (spectrometer), the result is usually given either as a power spectral density (e.g. in units of mW/nm or dBm/nm, with dBm = dB relative to 1 mW), or as a power for a given measurement bandwidth. In any case, there is some kind of energy, power, intensity or the like, which is distributed over some range of wavelengths or frequencies. Correspondingly, the integrated quantity has units of joules, watts, watts per square centimeter, etc. Optical power spectral densities can be related either to fixed intervals of optical frequency (measured e.g. in terahertz), or to intervals of wavelength (e.g. in nanometers). If the integrated quantity has units of watts, the resulting power density is measured e.g. either in watts per terahertz or in watts per nanometer. Great care is required for the conversion of such quantities, because the conversion factor is wavelength-dependent: for infinitesimal frequency and wavelength intervals, the conversion must be done according to dν = (c / λ2) dλ. This shows that at shorter wavelengths, each nanometer is worth more terahertz. A consequence of this is that the peak position of a spectrum with large bandwidth can significantly depend on whether the power spectral density refers to frequency or wavelength intervals. Confusion arises if such issues are overlooked or power spectral densities are not properly specified. See the Figures 1 and 2 as an illustration. Figure 1: Power spectral density of black bodies at various temperatures according to Planck's law, plotted referring to frequency intervals. Figure 2: Same as Figure 1, but referring to wavelength intervals. Note that this changes the position of the maximum. For 6000 K, for example, the maximum is at 483 nm, corresponding to 621 THz, whereas the upper graph shows the corresponding maximum at 353 THz. 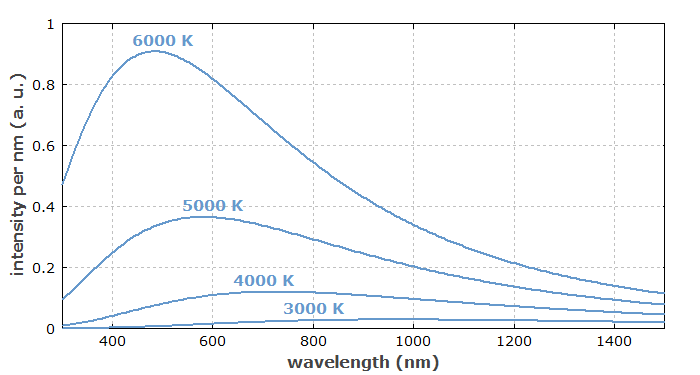 Optical power spectral densities are also required for visualizing e.g. pulse shapes with spectrograms. In that case, power spectral densities are calculated for limited time intervals by applying Fourier transforms to sections of data as extracted using some window function. In the case of noise powers, a PSD always refers to averaged power levels related to intervals of noise frequency (rather than optical frequency). Such noise PSDs can occur in the context of any optical or electrical signals. They can be used not only in conjunction with optical power (→ intensity noise), but also e.g. for phase noise, frequency noise, noise of a pulse duration, pulse energy, or timing jitter, e.g. of a mode-locked laser Similarly, PSDs can apply to electrical voltages or currents. 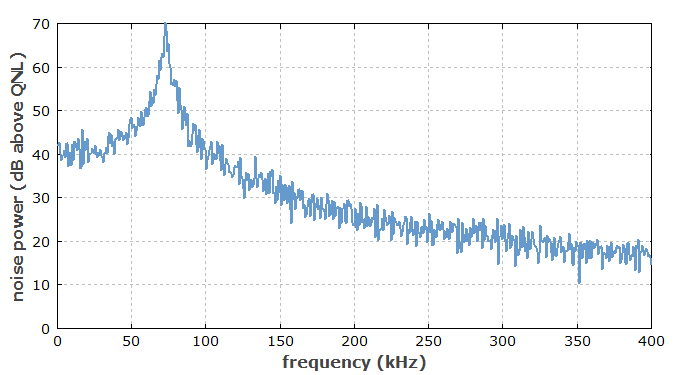 Figure 3: Intensity noise spectrum of a solid-state laser. Here, the power spectral density relative to that of shot noise is displayed. is the autocorrelation function of X(t). In any case, it is important to note that power spectral densities are statistical measures, which can be estimated from real data by averaging over the results from many measurements. Taking a single measurement trace gives only a very rough estimate of the PSD. Power spectral densities can be specified as one-sided functions of only positive frequencies, or as (two times smaller) two-sided functions of positive and negative frequencies. Optical power densities are usually one-sided and can be measured e.g. with an optical spectrum analyzer. Noise PSDs are mostly one-sided in the engineering disciplines, but often two-sided in physics. Noise power densities can be measured with electronic spectrum analyzers or calculated from data recorded in the time domain. They are specified e.g. in dBc/Hz (dB relative to the carrier in a 1-Hz bandwidth) for the relative intensity noise, or in rad2/Hz for phase noise. Sometimes, square roots of such power densities are specified, with the peculiar units of e.g. rad per square root of a hertz. The square root of such a value is a root-mean-squared (r.m.s.) value. Note, however, that such integrals do not always converge (e.g. when the PSD has a singularity at f = 0). In the case of phase noise, such a divergence is related to a finite linewidth. 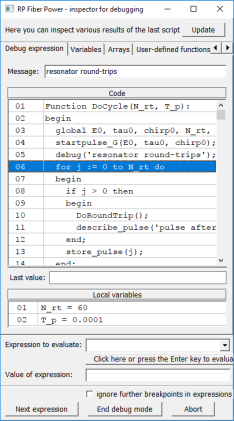 Noise integrals are also often used for calculating a signal-to-noise ratio. Adequate training concerning mathematical foundations, physical effects, and details of electronic spectrum analysis is required for dealing correctly with power spectral densities in laboratory environments.